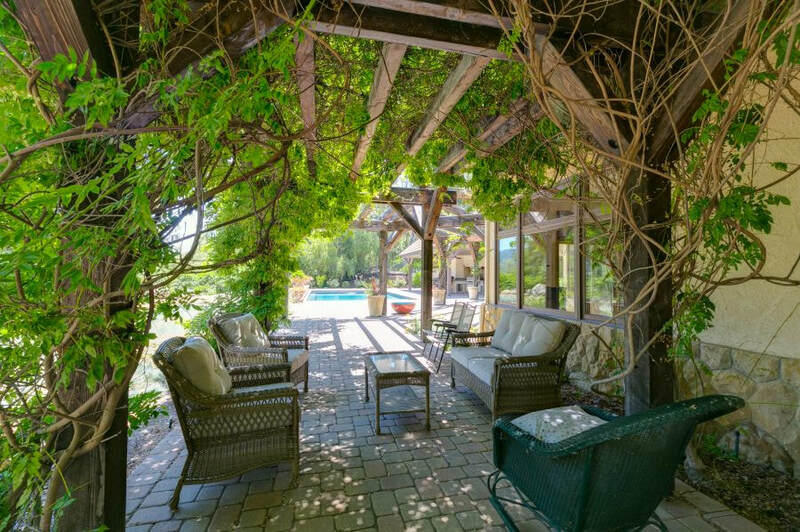 This upscale Ojai horse property for sale is the type of home that you have to see in order to take in everything that it has to offer. Kenewa Street is off of Creek Road, which is the curving country road that once was the stagecoach route and still delivers you to downtown Ojai where you will find eclectic shops, restaurants and galleries just minutes away. From this small cul-de-sac, head up a semi-private road to reach the private driveway that brings you home as you gently curve under the oak trees to reach the large, paving stone parking area. While there is a two-car garage, your favorite parking spot will be the porte-cochere connecting the garage to the main house where you can easily bring in groceries or load up the kids for soccer practice regardless of the weather. We all know this convenient side entrance is where you, your family and your closest friends are going to enter and leave the house, but it would be a shame to not – at least occasionally – enter through the front door to appreciate the full effect of what your guests see as they step into the foyer. 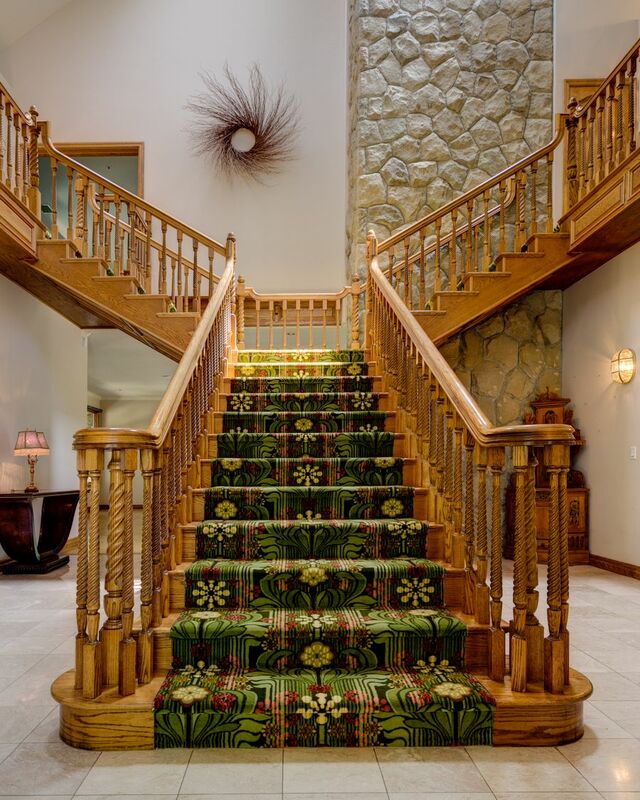 After all, there is just something about an imperial staircase that makes any entry just a bit grander. But that is not the only thing you will notice when you step through the double entry doors into this truly unique home. Your eyes might first be drawn to the floor-to-ceiling stonework that is primarily just the back of the chimney for the great room fireplace but looks more like a standalone work of art. 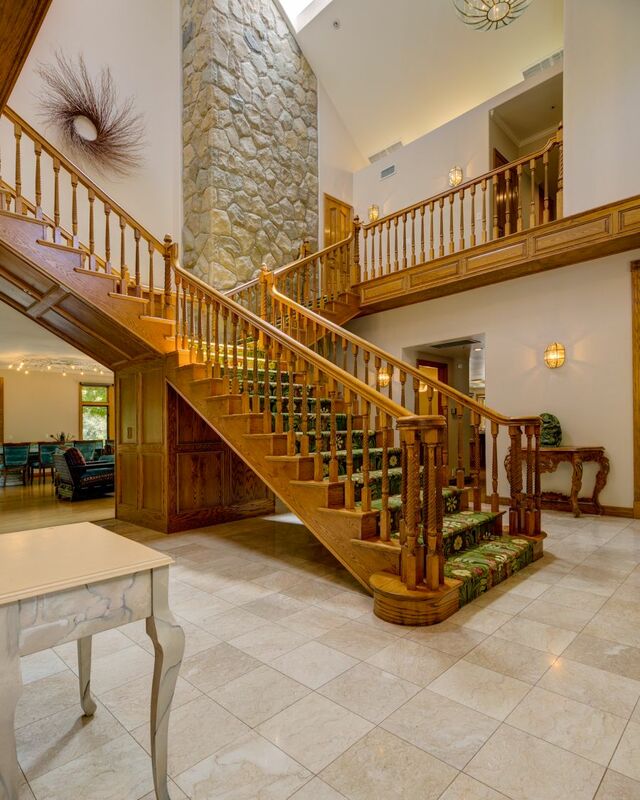 Just to the right of the foyer is the formal dining room, which is conveniently connected to the kitchen and has a gas fireplace with a tile surround. To the left of the foyer is a short hallway with a powder room and coat closet leading to the office, which has a tile floor and storage closet for all of the things you need to work from home or manage the household. If you go just past this hallway, you can step down from the entry into the family room, which has a hickory floor and gas fireplace with tile surround. Just beyond this, is the great room, where you will likely do most of your indoor entertaining. 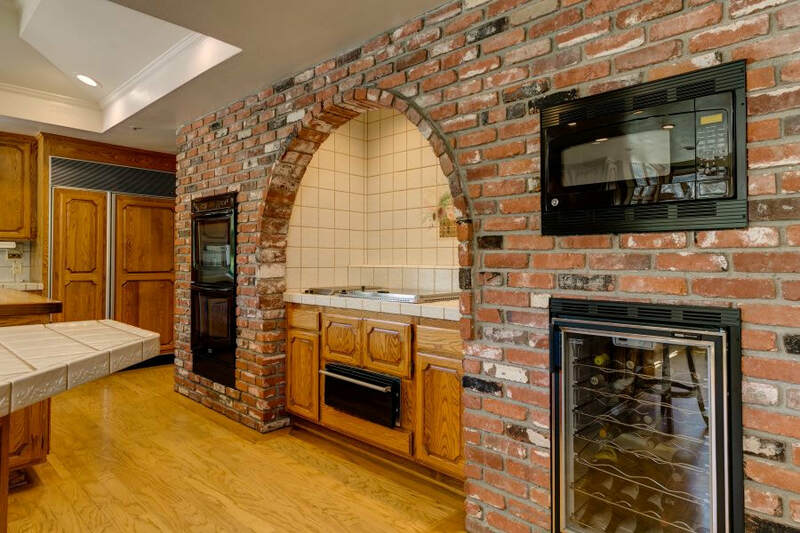 Here you will find a stone fireplace with adjacent, built-in drawers and shelves, an oak floor, and a sunken bar with tile floor, tile counter, built-in blender, sink and refrigerator. This spacious room also has plenty of space for a dining table, game tables and seating areas, and features a beautiful bay window with a window seat, where you can enjoy views of the outdoor living areas and nearby mountains. A sliding door connects the great room to the main outdoor living area for easy indoor-outdoor entertaining. The casual dining area connects the great room to the kitchen, which is packed with amenities. Whether you are a gourmet cook or insist on convenience to throw together quick meals, you are going to love this kitchen. 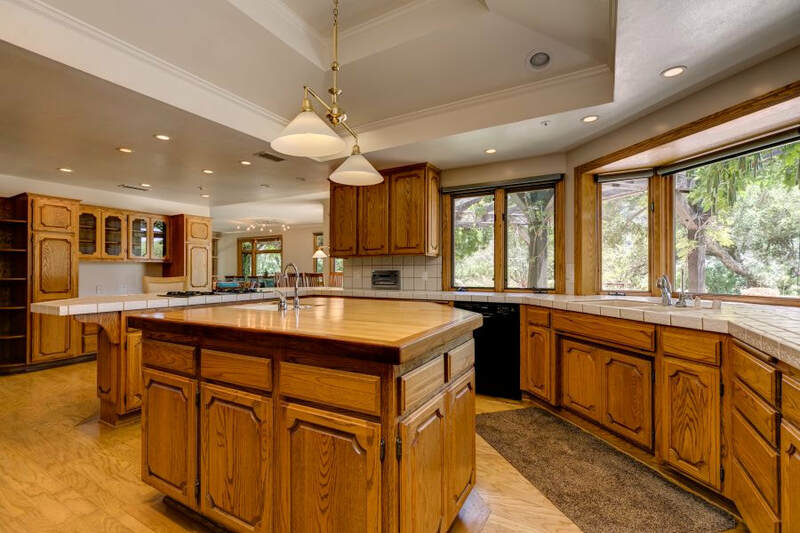 As you would expect in a home of this caliber, there is a large island with a produce sink and extra storage, a breakfast bar and plenty of tile counter space for preparing meals. There is also a wine refrigerator, double ovens, a built-in toaster, and a desk with built-in cabinetry and shelves. A separate grilling station features a tile counter, built-in grill and two burners, while the walk-in pantry has a built-in espresso machine to make sure you start your mornings off right. The mountain and pool views are a nice added touch for those who spend much of their time in the kitchen. Just off the kitchen is where you will find the laundry room, which has an oak floor, lots of storage cabinets, a built-in ironing board, and an LG washer and dryer set. Between the kitchen and main entry there is also a second, first-floor powder room with an oak floor and tile counter. While the main living areas are found on the first floor, the imperial staircase leads you to either the master wing or guest wing, both of which are located on the second floor. 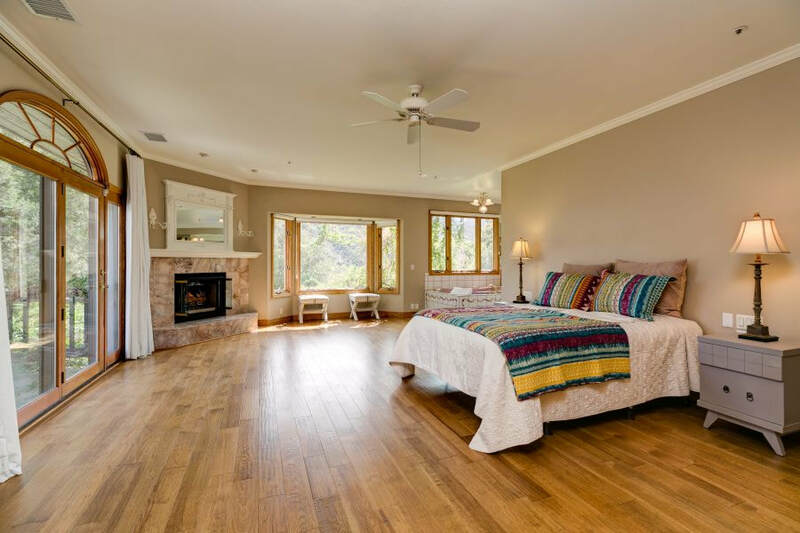 The large, open master suite features a hickory floor, ceiling fan, and a sliding door leading to a balcony with great views of two of Ojai’s most popular vistas: Chief Peak and the Topa Topa Bluffs. The en suite bathroom, which is open to the main bedroom area, boasts an over-sized, jetted soaking tub and a large, L-shape vanity with dual sinks and ample storage. There are two benches in the large, tile shower, and a separate water closet houses the lavatory and bidet. There is also a large, walk-in closet with built-in shelves and cabinets, as well as an additional linen closet. Also located in the master wing is an additional bedroom with an en suite bathroom and large closet. Due to its convenient location in this wing, it could serve well as an office, meditation room, home gym or nursery. If you, instead, choose to venture up the opposite side of the imperial staircase, you will find the guest wing, which is home to three more guest bedrooms, two hallway closets and built-in storage cabinets in the hall. The first guest bedroom has a walk-in closet, ceiling fan, and en suite bathroom with a tile floor, counter and surround for the shower and bathtub. The second guest room features a bay window with a window seat and built-in cupboards, a walk-in closet, mountain and pool views, and an en suite bathroom with a large, tile vanity and a tile surround for the shower and bathtub. The third guest bedroom in this wing may prove to be particularly purposeful, since it has a separate entrance, en suite bathroom and a kitchenette, which makes it a good choice for use as maid’s quarters or for long-term guests. The main outdoor living and entertaining area is just steps from the kitchen and great room, which allows for easy indoor-outdoor entertaining. The focal point of this area is, of course, the quite-inviting swimming pool with a baja shelf and spa, where you can enjoy mountain views while relaxing with friends. A paving stone patio wraps around three sides of the pool, while a low garden wall runs along the fourth side to separate the pool area from one of the garden areas. Adjacent to the pool on this large patio, is a covered entertaining area with an outdoor kitchen, powder room with tile floor, outdoor shower, and a linen cabinet for towels or patio cushions. 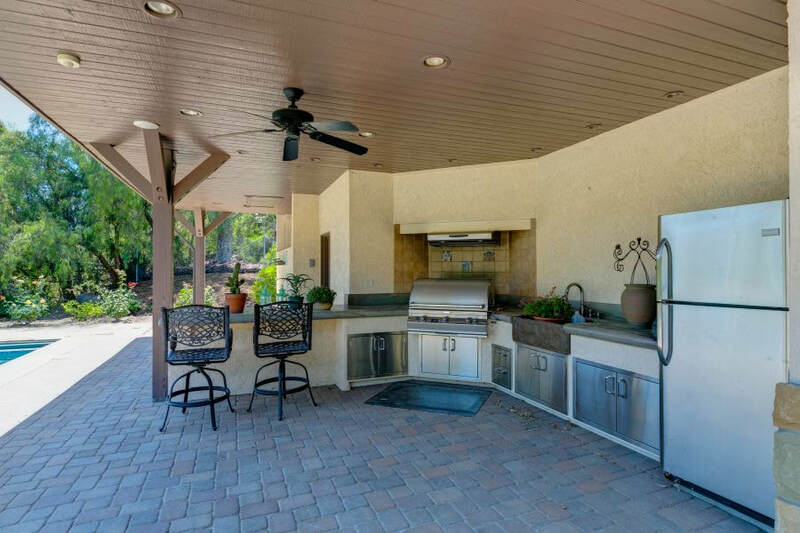 In the well-appointed patio kitchen, you will find a built-in barbecue grill, full-size refrigerator, sink, ceiling fan and a poolside bar, as well as a good amount of storage for all or your entertaining essentials. An expansive pergola covers another large section of the patio near the pool and continues around the house over the wrap-around paving stone patio that offers multiple spots to create seating areas. An ornate, metal gate separates the pool and outdoor kitchen area from the parking area and offers convenient passage to deliver your guests directly to the pool without needing to go through the house. You will also notice mature oak trees scattered throughout the property, fruit trees, room for a garden and nearby mountain views that can be enjoyed from almost anywhere. If you need a nearby space for an aging family member, an adult child returning home, long-term guests or rental income, you are going to love the guest house. This ranch-style home with two bedrooms and one bathroom has a separate driveway and separate address and is perfectly situated at just the right distance from the main house. It is located on the same, small cul-de-sac near the bottom of the driveway that curves up to the main house and, to anyone who is not aware, simply looks like a neighbor’s home. This is a particularly fortuitous setup if you are interested in renting out the guest house or if the home will be occupied by an adult child and their family or by an aging parent who would like to maintain some privacy and independence. This charming dwelling has recently installed tile flooring throughout the house with peek-a-boo mountain views from the living room, an eat-in kitchen with a sliding door to a partially covered patio and two single-car garages. 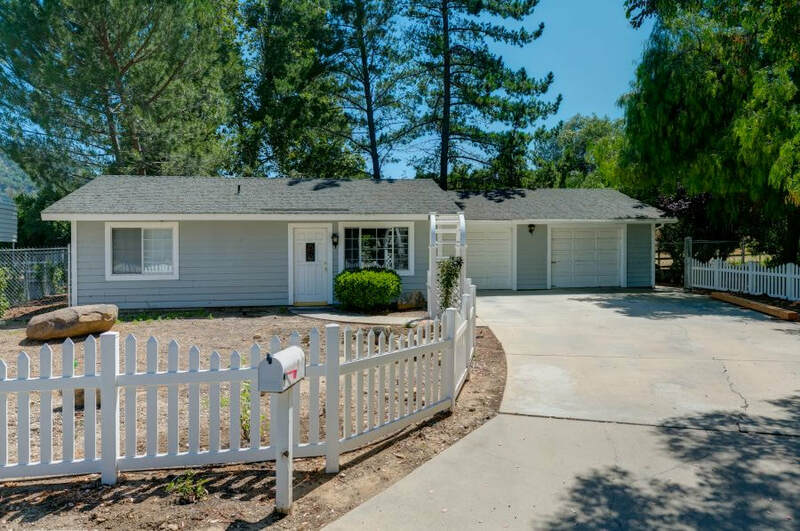 A quaint picket fence surrounds the home, and your guests are sure to enjoy the mature trees in the yard and in the adjacent section of the property where the horse facilities are located. For added convenience, or perhaps to facilitate a shared house situation, one of the bedrooms has a vanity with a sink located in the room. Of course, this great space could also be transformed into an art studio, writing retreat or a home office, which you might find particularly useful if you often work or see clients at home and would like to keep your work separate from your home life. Also at the bottom of the hill and adjacent to the guest house is a large, open area that is currently set up for use as horse facilities. Current structures include an arena and partially covered paddocks, both of which are portable, so you could move them to customize the area to best fit your needs. 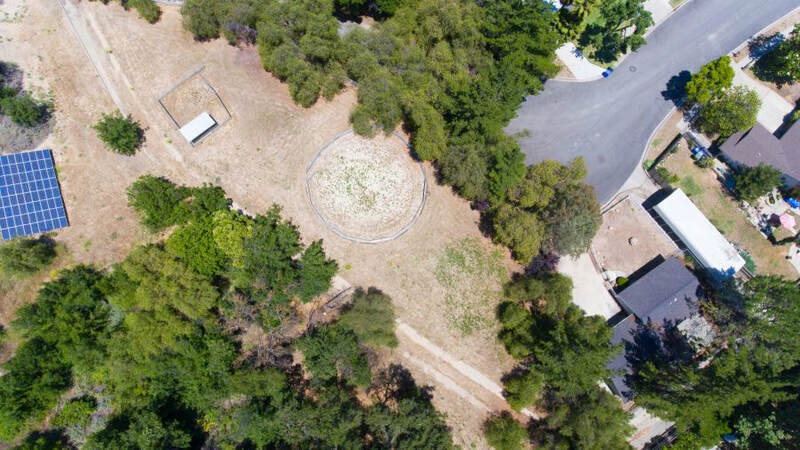 There is plenty of room here to expand the equestrian facilities, or you could easily remove the arena and paddocks if you prefer to use this great space for a different purpose. 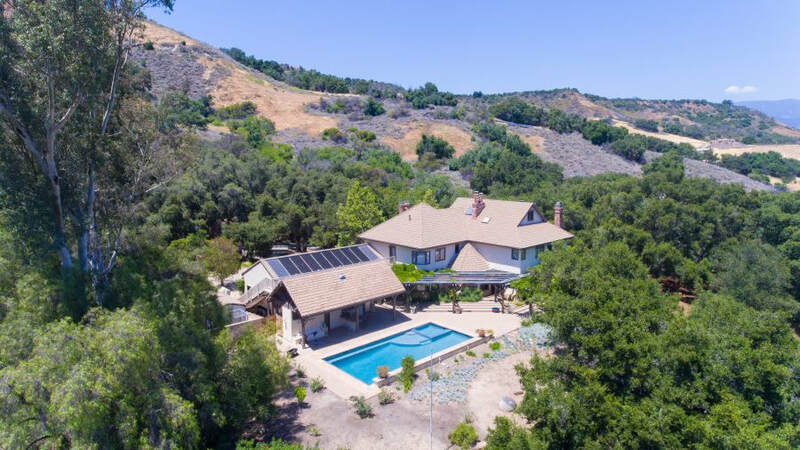 To learn more about this unique Ojai horse property for sale, or to schedule a showing so you can really see all that it has to offer, contact Nora today. This information was obtained from sources that The Davis Group and its agents, affiliates and/or data suppliers believe to be reliable. However, The Davis Group and its agents, affiliates and/or data suppliers do not guarantee the accuracy of this information, including pictures, videos or multimedia files. This information may change without notice. All references to square footage, year built, price, features or availability are approximations. You are advised to independently verify the accuracy of all information through personal inspection and with appropriate professionals.